West Brom took a significant step towards survival by beating West Ham to record a first home win under Pepe Mel. Saido Berahino's 10th-minute goal was against the run of play but the Baggies dominated thereafter. The win nudges West Brom five points clear of the bottom three and, with just three games remaining, they are edging towards safety. It also moves them to within a point of West Ham, with Sam Allardyce's side not out of danger yet. If that was not enough to cloud the manager's mood, West Ham supporters were once again vocal in their dissent towards him. They chanted their disgust at his substitutions and some even displayed a banner demanding his sacking after a seventh defeat in nine matches. Their anger is rooted in Allardyce's chosen style of play and was perhaps exacerbated by the fact this game was a victory for subtlety over strength. That is not to say that the powerful approach of the visitors did not yield chances. Indeed, their direct style should have forced an early goal, with Ben Foster thwarting Andy Carroll twice and Jonas Olsson having to slash clear after Billy Jones failed to deal with a Matt Jarvis cross. West Brom's wobbles did not last, though. Mel cluttered his side with quick, clever players and the Spaniard was rewarded with a splendid goal after 10 minutes. Stephane Sessegnon burrowed through the centre of the West Ham defence and slid a pass into the path of Morgan Amalfitano. The Frenchman sized up the situation and skidded the ball across goal for Berahino to convert. The lead enabled West Brom to play on the counter. One rapier break, led by Berahino, culminated in Graham Dorrans slapping a shot past an upright, and another ended when Adrian saved a fizzing drive from Jones. But the closest the hosts came to doubling their advantage was on the hour. Berahino stumbled when in a prime position but Sessegnon fed the ball back into his path, only for Adrian to prove the England under-21 international's equal. To compound it, the Spaniard thwarted Berahino again a few moments later. West Ham offered little in response and failed to prey on the growing nervousness of a side who have twice conceded last-minute goals - against Cardiff City and Tottenham - when in winning positions recently. There was one scare for the home side when Carroll's fierce header hit the crossbar, but that was the Hammers' only chance of note as West Brom held on to earn Mel his first home win in eight attempts. "The win was really very important. The atmosphere the fans generated really helped us and we can all go home happy. "Against Cardiff we drew, Tottenham we drew, then we drew with Liverpool, Chelsea and Everton so I really think we deserve that today. "I think that we need to win one of our final three games to be safe." "It's the same only story for us. We are striving to convert these chances but we've got to be more clinical. "We've put ourselves in a very difficult position with Tottenham at home and Manchester City away still to come. We leave ourselves hanging on and we don't want to be like that." "It's not for me to get concerned about off-field stuff. It's for me to focus on these players getting better and getting results. "I can understand their disapproval because we haven't won for four games - that happens everywhere when it's not going well. I accept the criticism coming my way because it's my responsibility to get it right." 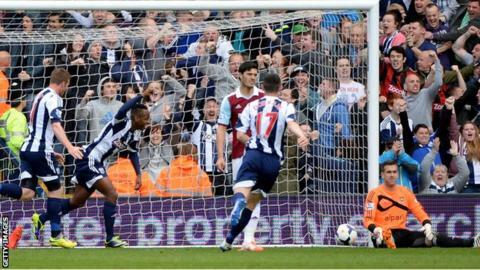 Match ends, West Bromwich Albion 1, West Ham United 0. Second Half ends, West Bromwich Albion 1, West Ham United 0. Substitution, West Bromwich Albion. Claudio Yacob replaces Saido Berahino. Carlton Cole (West Ham United) wins a free kick in the attacking half. Foul by Guy Demel (West Ham United). Substitution, West Bromwich Albion. Victor Anichebe replaces Stéphane Sessegnon. Attempt saved. James Morrison (West Bromwich Albion) right footed shot from outside the box is saved in the centre of the goal. Assisted by Billy Jones. Substitution, West Ham United. Carlton Cole replaces Matthew Jarvis. Attempt saved. Stéphane Sessegnon (West Bromwich Albion) right footed shot from outside the box is saved in the centre of the goal. Assisted by Jonas Olsson. Andy Carroll (West Ham United) hits the bar with a header from the centre of the box. Assisted by Matthew Jarvis with a cross following a corner. Attempt missed. Craig Dawson (West Bromwich Albion) header from very close range is close, but misses to the right. Assisted by Graham Dorrans with a cross following a corner. Corner, West Bromwich Albion. Conceded by Mark Noble. Attempt missed. Andy Carroll (West Ham United) header from the centre of the box misses to the left. Assisted by Stewart Downing with a cross following a corner. Corner, West Ham United. Conceded by James Morrison. Attempt missed. Youssuf Mulumbu (West Bromwich Albion) right footed shot from outside the box misses to the left. Assisted by Stéphane Sessegnon. Corner, West Bromwich Albion. Conceded by George McCartney. Attempt missed. Stéphane Sessegnon (West Bromwich Albion) right footed shot from the centre of the box is too high. Assisted by Graham Dorrans with a headed pass.